There’s a lot to be said for brushes and rollers, but when you have a big job to do, like a fence, then a fence sprayer is usually far and away the best option. Not only can you have 2 coats done in a whole lot less time than it would take you to do one using a brush or a roller but it’s so much easier to deal with rough surfaces and hard-to-reach places, plus you can get the sort of finish which makes you look like a pro. Added to all of that, fence sprayers use paint very economically, so you could save a bit of money, plus they’re much easier to clean than brushes and rollers (and you’re saved the time and hassle of cleaning trays and stirrers). Fence sprayers are perfectly safe to use, you just need to take the same kind of basic, common-sense precautions as you would when painting. In other words, wear overalls (and/or old clothes) plus decent shoes. Gloves, goggles and masks are highly recommended. Speaking of masks, be sure to use the right one for any given job, otherwise it will not filter out the atomized material. If in doubt, check the instructions on the material you are using. For the most part, the practicalities of using a fence sprayer are much the same as the practicalities of painting. In other words, make sure to use tape and/or dry cloths to protect any nearby surfaces you want to keep clear of pain. When doing this, remember that the whole idea behind using a fence sprayer is to cover large areas quickly and easily so be generous with your protection. As a final point, remember to follow instructions regarding the thickness or otherwise of the material you can use for any given fence sprayer. If your material is too thick it may clog the nozzle or cause other problems. It’s strongly recommended to start any job with a test spray to make sure that you have the right material at the right thickness and, where relevant, are using the right nozzle for the job. Regardless of what type of fence sprayer you choose, it will have three basic components. 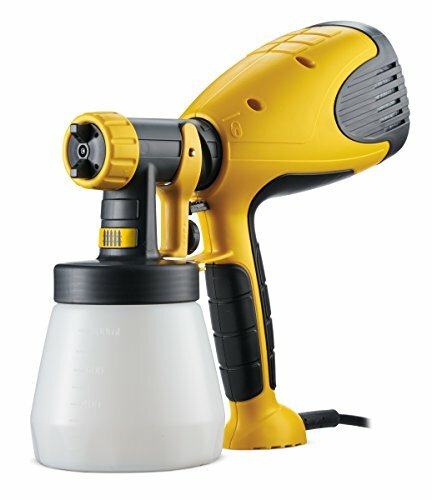 These are a spray gun, a container for the material and feeding system to transport the material from the container to the gun. Fundamentally all spray guns comprise inlets for air and fluid, fluid needles and tips and an air cap. While they are simple in principle, the quality of the spray gun will go a long way to determining how pleasurable a fence sprayer is to use. There isn’t really much to be said about containers, but size does matter, so make sure that you buy the right size for your needs. This will be either suction-based or gravity-based and for fence spraying the latter is generally preferable as they are lighter and easier to balance and therefore put less strain on your wrists over long jobs. Most feeding systems are now powered by electricity, but there are still some manual ones available. There are all kinds of paint sprayers available and only some of them are suitable for spraying fences. Confusingly, only some of these products are actually advertised as fence sprayers, others are just advertised as paint sprayers and you have to look more closely to pick up on the fact that they are a good choice for fence spraying. With that in mind, we’ve put together a collection of what we consider to be the best fence sprayers on the market right now. While you could argue the semantics of whether or not this is a fence sprayer, we’re going to say it is and what’s more we’re going to say that it does a very good job and could be an excellent choice for people who only want to paint fences and sheds and who want an affordable product which is both efficient and quiet as well as wire-free. Obviously, the downside to a manual product such as this fence sprayer is that you have to pump it occasionally, but it is only occasionally and it’s really very minimal effort, certainly much less than continually refilling a standard brush or roller. The basic idea behind this fence “sprayer” is that it combines the speed of a standard fence sprayer with the ability to follow with the brush, for greater control on wood panels, such as fences and sheds. In practical terms, the fact that it doesn’t really spray out in blasts the way other fence sprayers do means it’s not the very fastest fence sprayer out there, but it’s still pretty speedy compared to standard manual painting, plus it also means you get much less excess spray and hence waste less material. 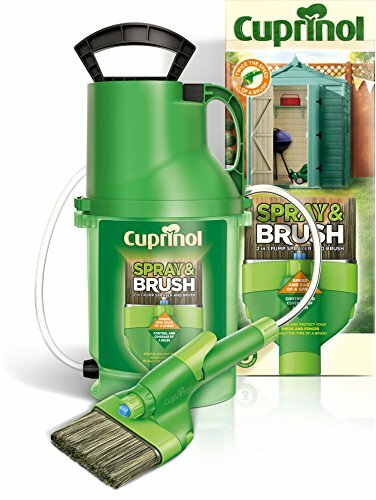 Speaking of material, even though this fence sprayer is produced and branded by Cuprinol, presumably in the hope that you will use it with their products, you can basically use any thin material, including diluted versions of thicker material. 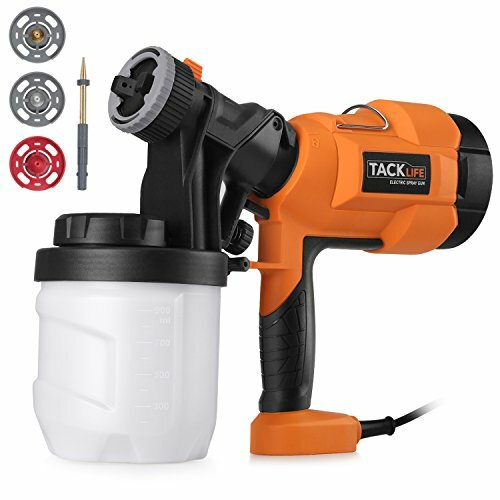 The TACKLIFE SGP15AC is a multi-purpose paint sprayer which also happens to work very well as a fence sprayer. 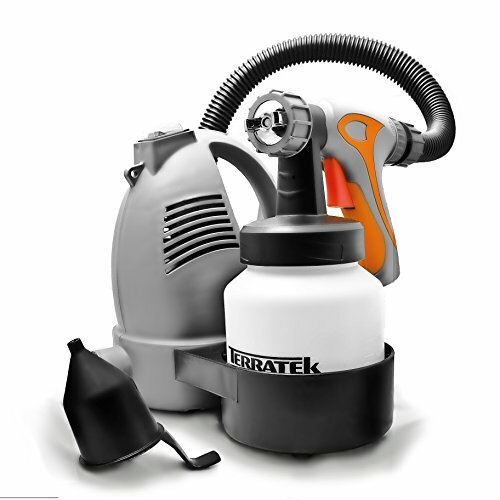 It is made of sturdy ABS plastic and the parts can be easily separated for cleaning and put back together for use. We especially like the fact that the spray gun is set forward of the container lid, which makes it particularly easy to fill. We also appreciate the 2-meter power cable for flexibility in use and the fact that this paint sprayer is very good at managing heat emission, which should help to extend the life of the motor. We have to say that the instructions for this fence sprayer could be rather better written. Here are the key points from it. You absolutely must ensure that the sealing ring is in the nozzle before you start to use this paint sprayer. Optimum spray distance is 25-35 cm. You rote the spray nozzle to select the spray pattern and adjust the width by sliding the switch. Overall, once you get past the instruction manual, you’ll find that this is a very decent paint sprayer for a very reasonable price. It works very well as a fence sprayer and can be used for all kinds of other jobs too. This option from Terratek appears to have been designed for flexibility, which is presumably why it has a carry strap (which makes it more comfortable to use for longer periods) and a decently long lead (1.5M). It works very well on a variety of surfaces and can cope with a wide range of materials, including anything the average person is likely to want to use on a fence. The instructions are very clear, so even a beginner should be able to be up and moving quickly. 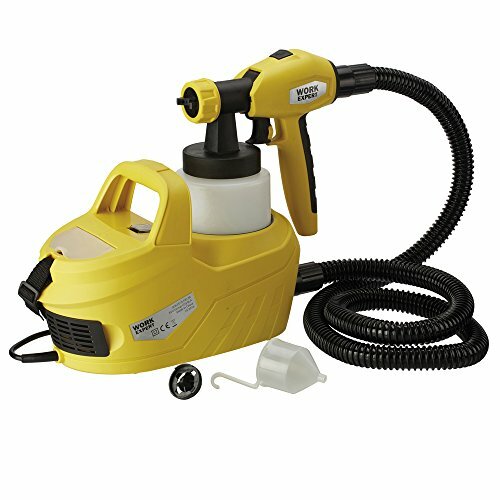 In fact, this paint sprayer appears to have been created with beginners in mind. For example, it has an adjustment mechanism to ensure that the paint is applied smoothly (for that professional-looking finish) and it regulates the flow of paint to prevent waste. Overall, if you’re looking for a beginner-friendly, multi-tasking paint sprayer, which also happens to work very well as a fence sprayer, then this could be a good choice for you. Wagner do actually produce a designated fence sprayer but this is more expensive and probably more than is necessary for the average home user who just wants a convenient way to treat their fence every once in a while. The W100 works perfectly well as a fence sprayer and can handle all the common fence-treatment products including wood preservative, gloss, satin, undercoat, stain and varnish. It can also be used on outbuildings, garden furniture and indoor furniture. Cable length is 1.8M. Although the Wagner W100 is a whole lot faster than using a manual paintbrush or roller, the reason its fans love it is not for its speed but for the quality of its finish. It has extra-fine atomisation for the smoothest coverage and the flow can be adjusted for those precise jobs. What’s more, the spray jet is surrounded by an air jacket to minimize overspray. The Wagner W100 can deal with even waxy thick paints with minimal to no dilution and is super-easy to clean after use. Overall, if you’re after a high-quality paint sprayer and prepared to pay a little extra for it, then the Wagner W100 is definitely worth a look. Perfect for spraying fencing, decking, garden furniture, doors, skirting, windows and other wood or metal surfaces. The Airless Electric 650W fence sprayer isn’t the tool for precision painting jobs, but then it isn’t meant to be, it’s meant to do larger, simpler jobs very quickly and efficiently. It’s lightweight so it’s easy to carry and the 2M cable will give you a reasonable degree of manoeuvrability. We do like the handle which is described as ergonomic and does seem very comfortable. Our one real gripe about this fence sprayer is that even though it comes with a viscosity measuring cup, we were unable to find any firm guidelines about maximum viscosity. The manufacturer’s advice is to use this fence sprayer with water-, solvent- and enamel-based paints, wood sealers, stains and varnishes and to avoid emulsion, alkaline and acidic paints. In other words, it can handle anything you might reasonably be expected to put on a fence. Another minor issue is that this fence sprayer could be easier to fill, especially since the speed at which it works (and the fact that it does generate a lot of spray mist) means that you’re going to be filling it pretty regularly. There’s only one nozzle (plus a spare) but you can adjust the spray pattern to suit your surface and type of material. Flow is quick and even, but not hugely accurate even with the spot pattern which was the most focussed of them all. If this bothers you then you can be generous with the masking tape and touch up edges and/or corners manually. You’ll still save yourself a whole load of time as compared to painting a whole fence the old-fashioned way. Overall, this isn’t going to be for everyone but if you have large stretches of fence to paint then it could be just right for you. The Cuprinol was in a class of its own, literally, since it is the only manual fence sprayer we’d recommend. It’s obviously limited as compared to the electric fence sprayers but what it does it does well, affordably and quietly plus the fact that it’s manual means that you don’t have to worry about the cable stretching as far as you need it to. With regards to the electric fence sprayers, the Wagner provides the most flexibility in use and the best finish whereas the Work Expert is very definitely a fence sprayer and only a fence sprayer, but if you have lots of fences to spray then it could save you a lot of work. The Tacklife and the Terratek are both good, mid-range, mid-price options which do a perfectly decent job as fence sprayers and can also come in handy for other jobs around the home and garden. The choice between them is really a matter of personal taste.